The holidays are upon us, and it’s time to get dressed up. The silver needs polishing, the shoes need shining and the kids need scrubbing. Even our food gets dressed up, with stuffings and dressings, garnishes and twists. Nothing escapes scrutiny, including dessert where dustings and dollops are par for the course. And, in the spirit of fancifying, what is known as the ordinary cake roll becomes an elegant roulade at the Thanksgiving table. What is the difference between a cake roll and roulade? you may ask. Well, nothing. Both terms describe a light cake which is rolled in a spiral with a creamy filling. Yet the blandly descriptive cake roll is what I might consider an afternoon dalliance. For my Thanksgiving dinner, I am inviting the roulade, a French term which elegantly and aptly sums up the nature of the dessert as the word itself rolls off the tongue. I want that dessert at our dressed up holiday table. Language aside, there are other reasons to include a roulade on your menu. It’s elegant yet uncomplicated, remarkably easy to prepare with stunning results. It’s a no-fail recipe, which is a welcome relief during the holidays and frees up more time to dress ourselves up for the guests. Inspired by a recipe from Ina Garten. Serves 8 to 10. Preheat oven to 375 F. (190 C.) Butter a 12 by 9 by 1-inch sheet pan. Line with parchment paper. Butter paper and dust with flour. Sift flour, cinnamon, baking soda, salt and nutmeg together in a medium bowl and set aside. Whisk eggs and sugar in a bowl of an electric mixer until light and thick, 2 minutes. Add pumpkin and vanilla; mix until smooth. Stir in dry ingredients until combined without over-mixing. Pour into prepared pan and spread evenly with a spatula. Sprinkle pecans over batter. Bake in oven until toothpick inserted in the center comes out clean, 12-14 minutes. Remove and cool on wire rack 5 minutes. While the cake is cooling, lay a clean kitchen towel on the work surface. Sprinkle with 1/4 cup sifted confectioners sugar. Invert cake onto the sugared towel. Carefully peel away the parchment paper and discard. Starting at the long end, carefully roll up the cake, jelly-roll style, in the towel. Cool completely on the wire rack. While the cake is cooling, combine mascarpone, confectioners’ sugar, cream and vanilla in bowl of electric mixer. Beat until light and fluffy. Stir in orange zest. Gently unroll cake on work surface. Spread filling evenly over cake with a spatula. Carefully roll the cake back up in the same direction, using the towel. Arrange seam-side down on a platter. Dust with confectioners’ sugar. Cut in 3/4 inch slices to serve. What an explosiomn of flavors! That roulade must taste divine. A fantastic and festive dessert. Wow. I want THAT dessert on my Thanksgiving table! Gorgeous and all my favorite flavors. This looks just wonderful!! 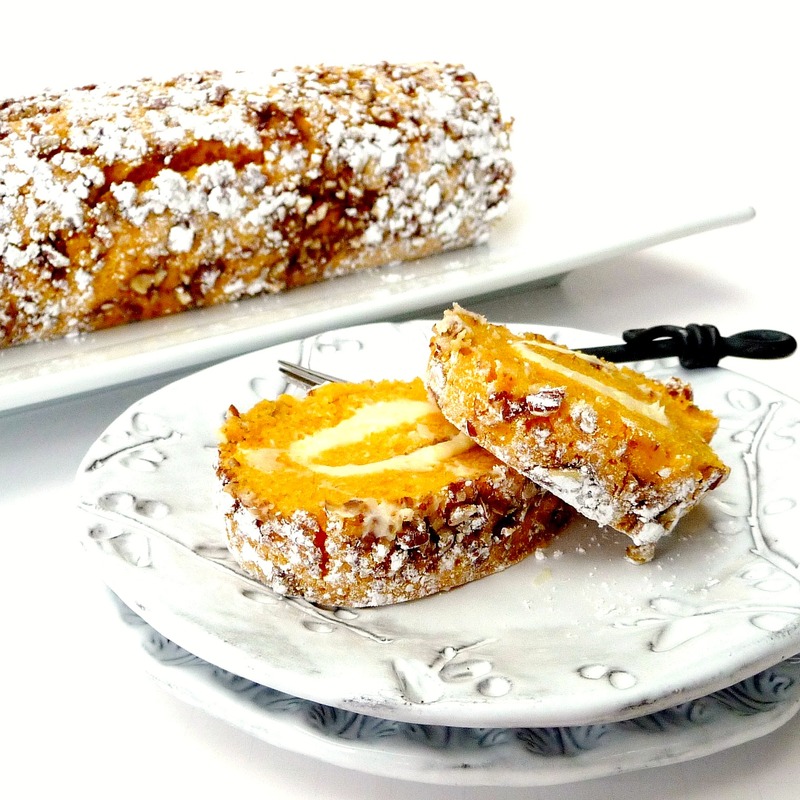 I was just thinking a couple days ago how I would go about doing a pumpkin roulade and now I have my answer. This would make a perfect non-pie Thanksgiving dessert. Well done! I second Kristy. This looks awesome! I have always wanted to make this from Ina’s book. Your roulade looks stunning. Planning to make Ina’s pumpkin banana mousse tart this year. What gorgeous colours and the roll of the roulade looks wonderful. My Mom used to make roulade all the time, but using a Genoise batter for the cake. She rolled in a cloth with sugar exactly like you indicate above. What a nice memory your post evoked for me, thanks! I absolutely enjoyed the new movie The Descendents.